Lead has come under a great deal of scrutiny from the Federal Consumer Product Safety Commission (CPSC) as a hazard in the home, and as a component in vinyl. Buy from manufacturer that uses vinyl that is lead free (under 100 part per million). . Certificates of compliance should be available for all of our customers and should be sent to you upon request.Choosing a Business Name As you know, starting a business requires planning. But it also requires something else. And this something else is the most important thing you will ever do as you proceed through the process of starting your business. It is creating a name for your business. 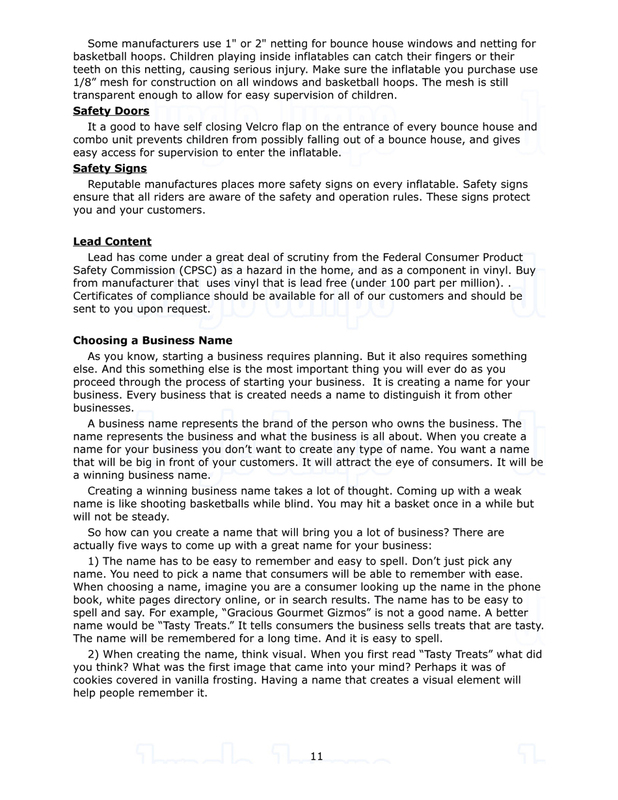 Every business that is created needs a name to distinguish it from other businesses. A business name represents the brand of the person who owns the business. The name represents the business and what the business is all about. When you create a name for your business you don’t want to create any type of name. You want a name that will be big in front of your customers. It will attract the eye of consumers. It will be a winning business name. Creating a winning business name takes a lot of thought. Coming up with a weak name is like shooting basketballs while blind. You may hit a basket once in a while but will not be steady. So how can you create a name that will bring you a lot of business? There are actually five ways to come up with a great name for your business:1) The name has to be easy to remember and easy to spell. Don’t just pick any name. You need to pick a name that consumers will be able to remember with ease. When choosing a name, imagine you are a consumer looking up the name in the phone book, white pages directory online, or in search results. The name has to be easy to spell and say. For example, “Gracious Gourmet Gizmos” is not a good name. A better name would be “Tasty Treats.” It tells consumers the business sells treats that are tasty. The name will be remembered for a long time. And it is easy to spell. 2) When creating the name, think visual. When you first read “Tasty Treats” what did you think? What was the first image that came into your mind? Perhaps it was of cookies covered in vanilla frosting. Having a name that creates a visual element will help people remember it. 3) A name you create has to have a positive connotation. If you look at the English language, you will find that words have a dual meaning – literal and emotional. People associate words as being positive or negative, depending on the word. So when you create a business name, make sure it has a positive connotation and connects with what your business is about. For example, since you want to start a party rental business, a good name would be something like “Creek Ridge Party Rental.” This name conveys strength and reliability. Plus it has a strong visual element. 4) The name you create must include what your business does. Your name has to give your customers a sense of what your business is about. If you sell handbags, your name has to be about handbags. Since you are considering a party rental business, you will need to create a name that references your party rentals. By having what your business does in your name, it helps consumers know what your business does, or what you provide as a product or service. 5) When creating your name, it should be relatively short. Keep in mind; you want your business name to be short enough for people to remember it and to spread your name to others. The name you pick should easily fit on a business card, or even be used as part of a domain name. This would be good because it can easily be found in search results.